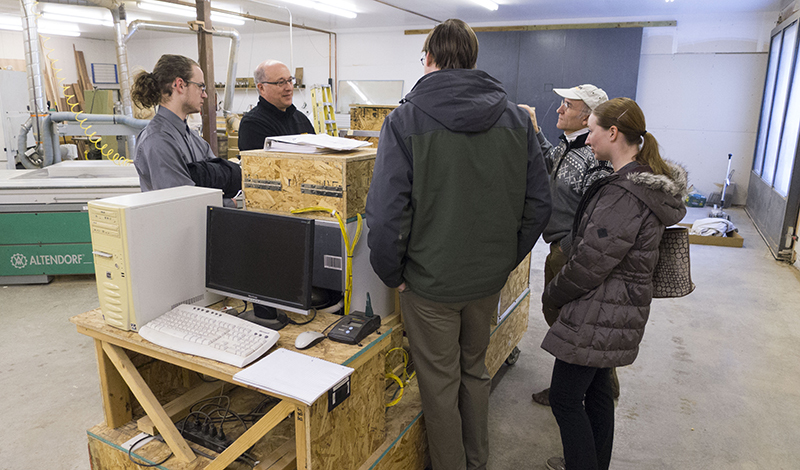 We are excited to partner with a group of students from the Mechanical and Industrial Engineering Department at the University of Minnesota Duluth. 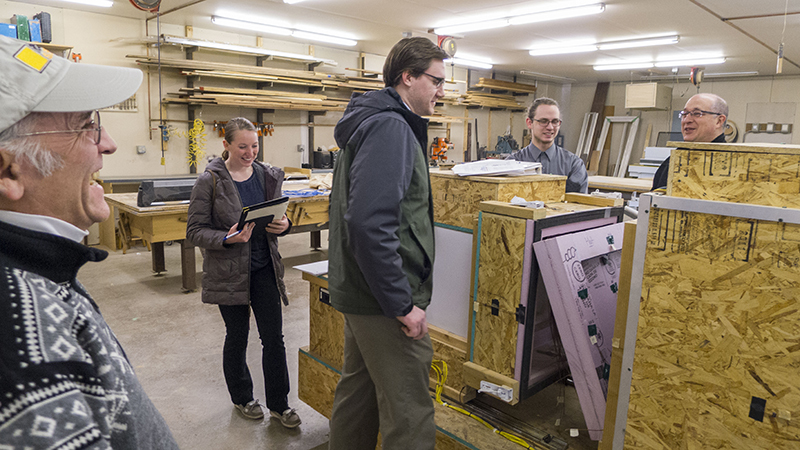 We’re working together on updating and streamlining a “hot box” that tests materials for performance to meet our extreme climate conditions here in the Northland. 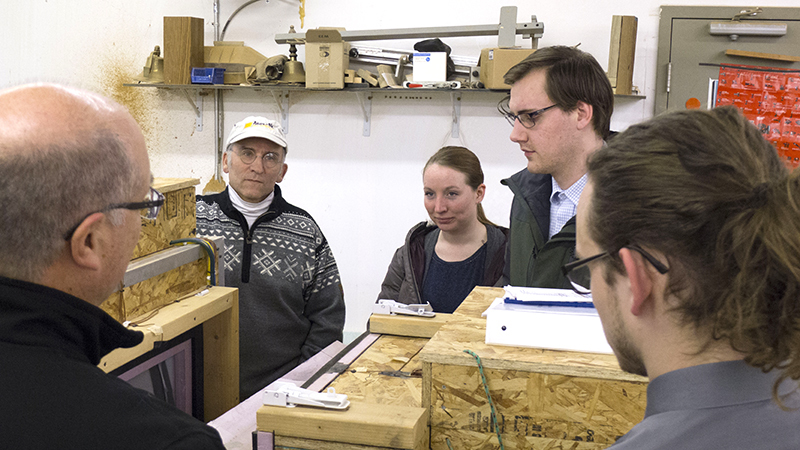 Randy and UMD Mechanical and Industrial Engineering students conduct research at Meteek. 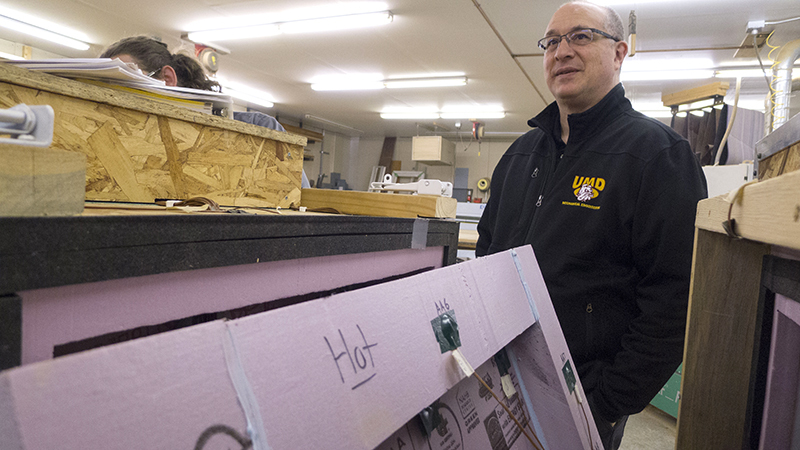 The project originated six years ago when Meteek & Co. offered UMD students an assignment to create a “hot box” to test the insulative qualities of window and wall sections, or basically any individual material. As part of their combined senior project, these students built, wired, and wrote the programming for this testing instrument. The project continues with a new group of seniors who will graduate this spring. This year the students are working with faculty mentor Jose Carillo. They will be updating the original Hot Box, a 7 foot plywood box on wheels with thermocouples. The box holds materials, such as window section, firmly in place. A program runs a freezer on one side and an oven on the other to create the thermocline necessary for the test. Results are recorded for each testing cycle. Springtime in Duluth never ceases to surprise and delight us! It snowed again overnight, but the temperature continues to rise today with a strong chance of rain. Who knows what next week will bring? Snow in April, rain in June, temperatures reaching over 100°F in August, and plummeting to -30°F in January? Duluth has a veritable smorgasbord of weather extremes, from humid heat, to driving rains, to bone-chilling cold. Developing technologies and employing materials to shelter us from such extremes is our passion! Here in the Northwoods, windows offer us both stunning vistas and protect us from our unpredictable environment. No small wonder we are so excited to see further development of technology to test materials for thermal conduction and insulation. For nearly 20 years, we’ve been using Accurate Dorwin fiberglass windows. Made in and inspired by the punishing prairie climate of Winnipeg, Canada, Accurate Dorwin provides leading edge technology in today’s window industry, developed specifically to address harsh conditions. Developing research and technologies, and employing materials to shelter us from such extremes is our passion! And we have fun doing it! We are accustomed to such climate extremes. And we continue to strive to find the best high-performance materials available to meet our climate challenges. If we can’t find it, we work towards creating solutions! Good luck with this project, students! Many thanks for helping Meteek & Co. to continue innovating solutions for our tough climate. We are partnering with Mechanical and Industrial Engineering Students from UMD to continue innovating solutions to our tough climate.